Got Dull Scissors? Learn How To Sharpen Them! Home/Sewing Machines/Got Dull Scissors? Learn How To Sharpen Them! One mantra that most every sewist has more than likely heard countless times is the one about having a dedicated pair of sharp fabric scissors. Scissors like this are essential for properly cutting fabric to be sewn with sewing machines like the Janome 7318. Although these sharp scissors are used only for cutting fabric, they will eventually get dull - it’s just a fact of life. A professional sharpening is always best; however, there are also some quick things you can do at home to sharpen any pair of scissors. If your sewing scissors are losing their edge, try these methods first so that the projects you make with Janome sewing machines come out perfect. If you frequently use scissors for many projects with sewing machines, it might be worth investing in an inexpensive home sharpener for knives and scissors. They are readily available at most stores that sell cutlery and scissors; they are safe and easy to use. Simply drag the scissor blades through the sharpening blades a few times to get a sharper edge. For an even more precise edge, a sharpening stone is convenient and easy to get your scissors sharp enough to cut fabric for stitching on Janome sewing machines. Inexpensive sharpening stones can be found at most hardware stores or home centers. They have a coarse side and a fine side for easy sharpening by simply dragging the scissor blades over the stone a few times. Pull them backward and diagonally to get the best sharpening effect. Start with the coarse side and finish with the fine side for a razor-sharp cutting blade that is ready for making precise fabric cuts. Be sure to prepare a new stone according to directions. The instructions usually say to soak it in machine oil, then store it in an airtight container. If neither of these items are available and you need to start another project you plan to sew on your Janome 7318, fold up 5 or 6 layers of tin foil and cut through them a few times. Cut along the entire length of the blades so they are completely sharpened. You can also make a few cuts through a steel wool pad; however, be prepared for the mess this often makes. Cut steel wool over a trash can to avoid scattering little pieces everywhere. With either of these methods, test blade sharpness after a few cuts and sharpen more if necessary. Sandpaper is another common household item that can sharpen dull scissors just like a sharpening stone. Fold a piece of sandpaper in half so both blades meet the sandy side, then make a few cuts. Test for sharpness and continue this until the scissors feel sharper. Regardless of how you do it, the key to success with anything made on home sewing machines is beginning with a sharp pair of scissors and fabric that has been cut accurately. If you need a quick fix and there is no time or money for an expensive professional sharpening, try one of the fast and simple methods above. 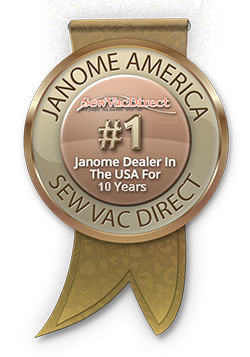 You will be less frustrated when cutting your fabric and experience less fabric wastage as you explore your creativity working with Janome sewing machines like the Janome 7318.